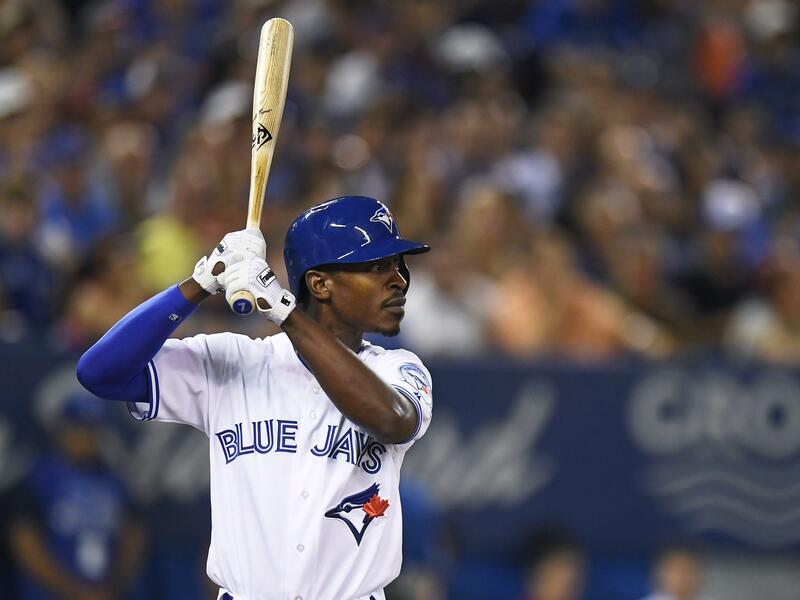 Tue., July 26, 2016, 8:04 p.m.
Outfielder Melvin Upton Jr. was already in Toronto with the San Diego Padres when they traded him across the diamond to the Blue Jays. The Blue Jays acquired Upton Jr. and cash from the Padres on Tuesday in exchange for minor league right-hander Hansel Rodriguez. Upton couldn’t join Blue Jays general manager Ross Atkins for an early afternoon press conference because he was at the nearest border crossing, in Buffalo, New York, being cleared to re-enter Canada. Upton has had a big season for the rebuilding Padres, who are mired in fourth place in the N.L. West. He is hitting .256 with 16 home runs, 45 RBIs, 46 runs scored and 20 stolen bases. He’s hit three walk-off home runs. “What attracted us to him was several things,” Atkins said. “The defense at all three positions, speed, base-running, base-stealer, power, versatility and depth.”Toronto is 56-44, three games behind Baltimore in the A.L. East. The Blue Jays hold the second wild-card spot. Upton is in the fourth year of a five-year, $75.25 million contract he signed with the Braves before the 2013 season. He’s owed $16.45 million next season. The Padres will reportedly pay all but $5 million of the $22.5 million remaining on Upton’s contract. Two of Toronto’s three current outfielders, Bautista and All-Star Michael Saunders, are free agents at the end of this season. “It would likely take an injury for him to turn into an everyday outfielder with us,” Atkins said. Atkins said the Blue Jays are “not done in any way” when it comes to trades, with an emphasis on improving the pitching staff. “There’s not one team we haven’t contacted on several occasions,” he said, adding that regular talks are ongoing with five to 10 teams. With trade rumors swirling, Upton sat out San Diego’s last two games, including Monday’s 4-2 loss at Toronto. Toronto will make a roster move to open a spot for Upton before Tuesday’s game. Robin Ventura insists he can work with Chris Sale despite the suspended ace’s critical comments about the White Sox manager. Sale is serving a five-day, unpaid ban after he destroyed throwback uniforms the team was supposed to wear for his start Saturday. Sale told MLB.com in a story published Monday that he doesn’t regret standing up for what he believed and said Ventura should have stood up for his players. Ventura shook off the comments and supported general manager Rick Hahn’s decision to send the left-hander home after the incident. White Sox executive vice president Ken Williams expressed support for Ventura and Hahn before Tuesday night’s game against the crosstown Cubs. Ventura, in his fifth year as manager, is in the final season of his contract and Chicago is fading from playoff contention after a 23-10 start. “The one thing I can say is the way that Rick and Robin I think handled the situation, it was a difficult situation, certainly a unique situation, but one in which I think they handled in an excellent fashion,” Williams said. Sale called the 1976 V-neck, collared jerseys “uncomfortable and unorthodox” in the MLB.com interview. Sale said he first complained about the uniforms in spring training and then twice revisited the subject before Saturday’s scheduled start against Detroit. Sale also criticized Williams during spring training for restricting clubhouse access for Adam LaRoche’s son, Drake. After seeing the collared jerseys hanging from players’ lockers when he arrived Saturday, Sale became enraged. When the team didn’t agree to change them out, Sale cut up enough jerseys that the White Sox had to switch uniforms. The volatile Sale and Ventura engaged in a heated argument during the 2014 season. In spring training this year, Sale accused Williams of lying to players after Williams banned LaRoche’s son from the clubhouse. LaRoche later retired, and Sale hung the jerseys of LaRoche and his son in his locker. Sale’s future in Chicago is uncertain. The White Sox were 49-50 before Tuesday’s game and third in the AL Central. They’re expected to field inquiries for Sale before the Aug. 1 deadline. Sale has a club-friendly contract that runs through 2019, counting two years of team options. Despite all of that, Ventura said he can “absolutely” still work effectively with Sale. The left-hander worked out on his own at U.S. Cellular Field early Tuesday and is scheduled to start Thursday against the Cubs at Wrigley Field. Star closer Aroldis Chapman joined the Cubs, arriving to a mixed reaction in Chicago and saying he couldn’t remember what management told him about off-field expectations and behavior. After Chapman’s awkward introductory news conference, Cubs president of baseball operations Theo Epstein insisted Chapman understands what the Cubs expect of him after an offseason domestic violence incident. When the Cubs announced the trade with the New York Yankees on Monday, the team released a statement from Chairman Tom Ricketts saying they were aware of his 29-game suspension to begin the season under Major League Baseball’s new domestic violence policy. Ricketts said he and Epstein talked by phone with Chapman before the deal was completed and “shared with him the high expectations we set for our players,” adding that Chapman was “comfortable” with them. But when asked repeatedly about that phone conversation before Tuesday’s game against the crosstown White Sox, Chapman said through an interpreter that he couldn’t recall details because he was taking a nap at the time the call came in. The question was asked several more times. A Cubs spokesman once asked the question himself to the interpreter, coach Henry Blanco. Asked again several minutes later during the group interview if he could now remember what Ricketts said, Chapman shook his head. “I still don’t remember,” he said in Spanish. Epstein called it a misunderstanding and that Chapman was “pretty nervous” as he faced seven cameras and more than two dozen reporters. “I was on the call, Tom was on the call, Aroldis was on the call and Barry Praver, his agent, was on the call. It happened and it was real,” Epstein said. Chapman was accused of choking his girlfriend and firing eight gunshots in the garage of a Florida home in October. The woman later changed her story and no charges were filed. Marlins 2B Dee Gordon will be eligible for reinstatement on Thursday from his 80-game suspension after violating the league’s performance enhancing drug policy. … The St. Louis Cardinals put reliever Trevor Rosenthal on the 15-day DL (right shoulder). … The Washington Nationals have reinstated 1B Ryan Zimmerman from the DL (left rib cage). … Rangers righty Kyle Lohse was designated for assignment. The Rangers also recalled top prospect Joey Gallo from Triple-A Round Rock and right-hander Nick Martinez, and OF Jared Hoying was optioned to Round Rock. … The Baltimore Orioles have reinstated rookie OF Hyun Soo Kim from the 15-day DL (right hamstring) and welcomed back pitcher Ubaldo Jimenez from a three-day paternity leave for the birth of his daughter. … A 75-year-old woman was taken to a hospital on a stretcher after being hit in the face with a foul ball in the first inning by Washington’s Daniel Murphy. A family member said Muir West’s glasses were broken and she received a cut on her face. Published: July 26, 2016, 8:04 p.m.